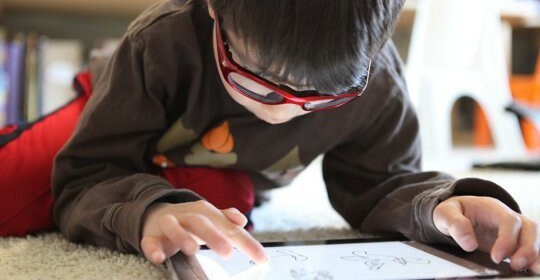 Donovan and I have been researching how a near screen activity, such as a cell phone, I-Pad, Leap-pad, PSP, Nintendo, Tablet, etc, affects the visual abilities of children. Up to this stage of the research project, we have become aware of an increased volume of children with visual difficulties which, in the main, have been due to the increased volume of near range activities such as ‘screens’ of various types (as mentioned above) and to a moderate degree: television. In Baltimore City (USA) – A Long-Term Project similar to our project was presented at the 2002 Mid Atlantic Congress (sponsored by OEPF), and as with our research, is ongoing. Abstract: A longitudinal, single-masked, random sample study of children at a Baltimore City Public Elementary school documented the prevalence of learning-related visual problems in the inner city of Baltimore and tested the effectiveness of vision therapy. Vision therapy was provided to one of the randomly selected groups, the data was collected on similar optometric tests, visual performance tests, and standardized achievement tests before and after visual therapy treatment was provided. The Data demonstrated that the vision therapy program definitely made a significant difference in the demand level of reading, for which the comprehension thereof had also improved. Mathematics achievement also showed a significant improvement, on standardized testing, and in reading scores on standardized testing, as well as on infrared eye-movement ReadAlyzer recordings, which show significant changes on nearly all mechanical aspects of the reading process. The paper presented in 2002 and subsequent ongoing research and papers, therefore makes a strong case that untreated learning-related vision problems are a significant public health concern and that the profession of optometry has a treatment modality that can address these problems in a significant way, without the necessity of prescribing spectacles. The paper presented many of the difficult questions that had to be addressed during both the early formation stage of the study and during the execution of the study. The rationale behind the key decisions that had to be made during each step of the program was provided so that future researchers (such as myself and Donovan) are now able to replicate this study with full knowledge of what to expect, albeit that the results would relate to children in South Africa and not from the USA.